The next night I found my way to an area I’d never stopped at previously… there was a roof constructed, over a small area, with a picnic table underneath, a long bench along one side, and a woodstove made of mud and brick opposite that bench. That woodstove seemed like a relic from some past time lost to us today in the modern West, formed with clay from the earth by the hands of workers who loved this place, and designed for a concrete human purpose. It wasn’t made by some machine in a factory line taking orders from a computer in the pursuit of generating corporate dividends… a different reality all together… They kept a good bed of coals inside the stove and cooked crispy little grilled cheese sandwiches inside a cast iron sandwich press. The rain was gently drizzling outside, and people packed in underneath the roof to keep warm and enjoy each other’s company. When people first arrived from the wet night, they’d stand close to the woodstove and rub their hands together, warming themselves up before retreating towards the picnic table or the long bench and joining in the conversations all around us. Felipe brought a little battery powered radio and tuned it to a station playing some variation of samba, and everybody started dancing… one of the women wanted to dance with me, but I didn’t know the steps and she taught me, really quickly… “it’s easy,” she said, “just two steps to the left and then two steps to the right… but take bigger steps to the left so that we spin in a slow circle.” And it was easy, and she was beautiful, and everybody was beautiful, dancing and smiling under the shelter of the roof, the wood-stove emanating heat, and the people emanating heat too, dancing together while others looked on, munching on crispy sandwiches and laughing in the night. It was amazing, and I wanted to hide inside that moment forever, and I thought to myself how great it was the way that certain places can gather a community into itself. Like that woodstove was doing in this joyful night – like the Greek temple did for the ancient Greeks with their daily religious rituals, like the medieval church did for the inhabitants of any given village, gathering the day to day life of the inhabitants into a meaningful totality. But today, such locations, such locales, are few and far between, and they rarely exist as permanent organizing structures for day to day life. Instead, we’ll find them scattered here and there in the wasteland of modernity. Here at a music festival an alternate community pulls the temporary inhabitants into a beautiful caring relation, and the woodstove brings us all together spontaneously under the damp sky. We finished out the night with a handful of people softly playing forró around the picnic table, and the next morning I found myself at the woodstove again, sharing a breakfast of fruit and nuts with the others. We pattered around on some instruments, a couple people playing guitars and some hand-drums here and there, and we relaxed in the morning light, slanting sideways under the roof. Eventually, as the sun rose in the sky bringing the temperature up with it, everybody was going down to the waterfall again, now 10 people going, now 4, now 12, and now 7 coming back up the hill, and now 5 returning, etc. I went down and rinsed the sweat off under that crisp, cold water, and there was a great jam session tucked in between the rocks down there in the stream bed… a few djembes (a type of West-African hand-drum), a few digeredoos, a couple guitars, and some shakers, and they were blending in with the steady roar of the waterfall, and livening up the wilderness with their sound and with their smiles. It was great fun, and went on for an hour or so, but then we noticed that a bunch of people were arranging themselves nearby the woodstove, which was right in the middle of the hill, above the lower cluster of tents and the row of wooden dormitories, but below the kitchen and the bar on the hill…. they were all dressed in crazy costumes, like Halloween in the U.S., but without the monsters and gory masks…. one guy dressed as Caesar with a white robe and crown of olive leaves, another as Bruce Lee, another as a character from street fighter, a slew of people dressed in the sort of typical flashy getup for Carnaval—and everybody had this orange dye smeared all over their back, and chest, and face, each in their own pattern… it came from the pod of a plant called urucum. They had a ton of these pods, still on the branches that they’d harvested from somewhere nearby, and inside each pod was 30 or 40 little pouches of a natural orange dye… they were playing music in their own wild way, probably with 15 drummers, each one banging on a different drum, some with sticks, some with hands…. a handful of brass instruments, a trumpet, a sax, some others… a clarinet… a wild school of samba in the countryside… and we all started walking to the top of the hill and out to the red dirt road that brought us there. We headed in the direction away from Munhoz, and I wondered where we were going…. Everybody was dancing to the music as we went, myself included, and I was learning how to dance properly, on the balls of my toes, taking many quick little bouncy steps as though running in place, but always on the balls of my toes, and back and forth with the rhythm, giving my calves a great workout in the process… it was a slow march down the great dirt road, winding through the trees and fields of rural Brazil, a great dust cloud rising up behind us as we went. Once in a while a car came and had to get through, and everybody cleared a way for the car to pass, and reached their hands into the car to pat the people on the arms, and those people in the cars really got a kick out of it… Imagine the strangeness of this situation for a tiny little town four hours from any major city. Here are all these maniacs playing a wild samba and kicking up dust in the country road, celebrating Carnaval without the strange hedonistic madness of that was going on in Rio de Janeiro at the very same time. And suddenly I was reminded that the other Americans were in Rio, and I wondered what sort of a time they were having. I was glad that I’d chosen to come to the countryside… and later on I learned that they’d had a bunch of drama, half of them’d had their cellphones stolen or lost, and there were 12 of them all in a one bedroom apartment, fighting and clawing for space. Quite a different scenario than what I was immersed in at Munhoz, with the great expanse of the rolling hills, the waterfall for showers, the community of music, and the pure joy of the celebration. We arrived at a little cluster of 5 or 6 buildings, and one of them was a country store, and that was our destination. Probably 150 maniacs brought their great roar of music and talk and laughter to the store and only 20 or so people could fit inside while the music continued in the red dirt outside. I was feeling hungry and dehydrated by this point, but they didn’t have much food without gluten, so I bought a jug of orange juice, a jug of water, and a big bag of peanuts, and I munched down a bunch of peanuts and slammed a glass of orange juice right away. I put the orange juice and water and peanuts on the table so that everybody could have some, and I saw the woman I’d danced with the night before, and told her that her children and the other kids who’d come with her could help themselves to the juice and nuts and water. I settled down on the concrete slab of the store, where it met the road, making a tall curb to sit on, and just munched on peanuts as I enjoyed the unfolding of the scene. The music was still going strong, but I couldn’t see the majority of the people, they had gone around the corner now, and were taking a group photo, but I didn’t feel like getting up and getting in any photo… I just wanted to sit and enjoy this shared mood that we were all participating in. There were still a good thirty people milling around by the front of the store, and I was happy staying right where I was. After some time, I noticed that a truck was going back and forth between the site of the festival, and the country store, bringing loads of people back to the top of the hill each time. I decided to catch a ride… I didn’t want to walk up the hill. My ankle was bothering me because I’d twisted it the day before, so I piled in with a dozen other people and we all held tight for the rumbling ride to the top, passing by dozens and dozens of people who’d started the trek up. The sun was settling low in the sky, and I headed to the deck by the kitchen to wait for the others to make their way back up. That night passed like a dream. It was the last night of the festival, and the reggae band that everybody loved the most played for over four hours, and I danced so much that my legs were sore beyond belief for the next five days after the festival. In particular, those two days after, I couldn’t do more than hobble between my bedroom and the kitchen to get water and food and then head back to bed to read and rest. Walking up or down stairs was out of the question, my muscles were so sore, my calves were done! And my lousy old joints were throbbing with that old familiar pain… the surgeries, the Lyme disease, all that nonsense always comes back to haunt me. It’s true that Munhozstock wasn’t really “Carnaval,” in the typical sense of the celebration… it was more like an anti-Carnaval, where Brazil’s counter-culture went to recharge themselves and see what community can feel like. It’s true that the other Americans in the exchange program thought that I was kind of an idiot for missing out on the wild party of Rio, but I was thankful for the times I’d shared with all those amazing people in Munhoz, for the friendships that I’d forged at that little festival, for the celebration of life that it truly was. The first night passed pretty quickly… I didn’t know anybody, and my Portuguese still wasn’t too good, but it didn’t matter, I just kept having the same little conversation with innumerable people, about where I came from, growing up in the hills of New York and moving to Arizona after 20 years when I was going mad in that little place, about why I came to Brazil, to learn the language so that I could return for graduate school and study participatory budgeting—the remarkable form of local democracy that only such an affable, beautiful culture as Brazil could have invented—and they did invent it, back in 1989, shortly after the military dictatorship was overthrown, and then the process spread to cities on every continent in the world and continues to gain momentum to this day. Most people hadn’t heard much about it, and were interested to learn something new about their own country from this American. When I wanted to meet somebody new, I’d just ask them for a lighter or offer them a cigarette, and then I’d repeat the story again, but each time it was different, because I was talking with a different person, and the conversation demanded a particular way of telling the story, not just repeating a script, and each time new details came out that I had completely forgotten about, and before I knew it I was having whole conversations in Portuguese, making friends with the best people from São Paulo, and thoroughly enjoying every moment. Sometimes I’d just sit and listen to the sound of the soft music, rolling off the fingertips of a handful of people in the bar as they pattered away on their hand drums and gently stroked their guitars… and I’d listen to the Portuguese words of the people talking all around me but deliberately avoid understanding them just to hear the lovely melody of their language… and all that noise was filling the mysterious space between human selves, linking them all in a warm embrace, obliterating the distinction between the self and the other. The time had come for dinner, and I parted with my newly made friends, and found the people I’d come to the festival with, and we headed over to the kitchen to wait in the great line wrapping around the veranda. When I got to the cashier, I saw a few items wrapped in plastic and some fruit, but the main course was a soup that they’d made in one huge pot, a vegan soup—the whole kitchen was vegan—that was hopeful, “maybe it’ll be gluten free too,” I thought. But the soup had gluten, it had been thickened with flour… I was horribly hungry now, I hadn’t had anything in my belly for hours, besides peanuts and wine, so I just meekly asked her what they had that didn’t have gluten. She pointed to a couple sweets wrapped in plastic—little rice cakes of sorts—and I ordered three of them and an apple. The chef saw what was going on from the kitchen, and came out to my table after I’d sat down with my friends, who were eating their hearty soup as I ate my sad rice cakes… I couldn’t understand her, my mind couldn’t focus, I was feeling lousy, thinking that I was going to starve all weekend, eating sugary rice cakes and miserable apples, and Fazzi talked to her, explaining that I couldn’t eat gluten… a pained expression rolled over her face and she told us that she’d make a special soup, just for me, without gluten. “Ah! What people! What a place!” I’m thinking to myself, ecstatic. Fazzi too was impressed, “man, that’s Brazilian hospitality at its best!” It was great, and after everyone else at our table had finished she brought out a whole pot full, and I scarfed down three big bowls out of that, and she insisted that I don’t pay for it today, but said that each day she would make sure that there was something for me without gluten available. For breakfast, I’d usually have a big slab of cheese with a couple apples and a glass of milk and a coffee, and for dinner, she just started cooking the entire course gluten free for everybody. I was in love with this place, with these people, with this country. After some time, the main performance started up and everybody headed over under the great tent, and we all danced and sweated together for three hours before heading back over to the bar for a few more rounds of wine. This time I found a set of bongos and set to work weaving into the rhythm with everybody else, and I was squeezing them between my knees so hard that night that I had little bruises on the inside of each leg when I woke up. Eventually the bar slowly emptied out until it was just me and a few others playing music and drinking wine. We stepped outside to have a cigarette, and to have a look around, and we saw seventy or so people gathered around the main campfire, which had been setup with massive logs laid around it as benches. We headed over and the music continued there—dozens of people playing all sorts of strange little hand drums, one guy on a cajón, that wooden box that you sit on top of and slap in the front to get a variety of tones, incredibly deep booming ones in the middle of the box, and really high pitches tones when you slap the edges… and there was old Filipe, keeping that subtle rhythm on his triangle, hanging off to the side, carrying on some crazy conversation with a small group, sending them all into eruptions of laughter as he just calmly smiled and kept the rhythm with that beautiful little piece of steel… there were a couple didgeridoos and three or four guitars, and they were playing songs that everybody knew, so a great chorus of voices raised up into the night sky with the sparks and smoke from the fire, and I wondered how that old farmer on the neighboring hill was enjoying this Brazilian folk music… it’s probably a treat for him, once a year, they have this festival, and he gets to see a bunch of strange folks from the city, and listen to all that wonderful music. This folk music, is called “forró,” but it’s pronounced “fo-ho,” and it actually derives from an English phrase “for all,” but with the slow speech pattern of the northern states of Brazil where the music had originated, where the sun of the tropics slows everything down, even the language, “for all” had been transformed into “fo ho.” I played the bongo until my eyes grew tired and then headed off to the tent to get some rest for the day to come, the rhythm of the music resounding in my mind. When I woke up, I opened up the door to the tent and laid back down, looking across to the green hill and its cattle, just as I’d imagined before… I laid there for ten minutes, gathering my thoughts, and munching on peanuts. Then I crawled out and laid in the grass for awhile, closing my eyes and feeling the sun on my face. After the rest of the gang woke up, we all headed up for breakfast, ate, and then headed down the steep slope to the waterfall… past all the tents on the hill below the kitchen, past the field of tall grass and wild flowers, past the little area that had been cleared for lumber when they built this place, and into the folds of the dense woods beneath. Wooden steps zig-zagged down the slope, weaving between vines and trees and palms and all sorts of exotic plants, with insects and birds singing and swimming through the air. I held on to the little rail that had been constructed out of saplings and made my way down. The water was cold, cold, cold! But it was so refreshing that I just stood under it for a good 2 minutes… the cold put pressure on my lungs and I had to make an effort to breath in a regular pattern… The sweat rolled off my skin, and flowed down the stream, and eventually into the Atlantic ocean, where it mixed with the sweat of all the people swimming in all the rivers in the world, and I thought of the kids in my home town, jumping off the cliffs into the Hoosic river as I had done as a kid, sweating into the eventual Atlantic and tasting the exhilaration of life with each jump—all rivers flow into the ocean, and all humans tap into the same life-source when they revel in the bliss of existence. I scrubbed down my body and figured that this shower was good enough for me, and I hopped out of there feeling like a new man, and we headed back up through the vines to the bar above, passing by gentle jam sessions in every little space as we went, and there was a great jam session in the bar again, as always, and we played and felt wonderful. Later in the night, people learned that I could play harmonica and they wanted to hear it. I pulled it out of my pocket, and they started a blues jam and I cranked out my woeful melodies for thirty minutes, but then put it away so that people wouldn’t get sick of its cries. I remember one moment when we were playing a particularly wild part, and the guy on the ukulele was swapping melodies with me, we were going back and forth, tangling up our notes with each other and letting something new emerge among the driving rhythm around us, and all these cameras were swarming around, people were recording us playing this bluesey, funky number, me on the harp, a guy on a ukulele, two people playing guitars, four or five people playing a variety of hand drums, and Filipe on his trusty triangle. I never saw any of the videos, and I’d rather keep it that way. I prefer my memories of the feeling of the moment over the static, dry recording of the noise… any day. A moment in a jam session can’t be captured by a video camera or microphone—these devices lose all the interconnections that you can feel when it’s happening, between the various musicians, between all the people who are humming or clapping their hands or banging their hand on the table to the rhythm, or just exchanging looks with the musicians, changing the course of the melody with their very presence. It loses that glint in the eye of the guitar player outside the frame, of the smile on the face of the adorable girl rocking to the music across the room, of all the immense human connections that you can feel when you’re there inside that moment, inside that whooshing up of life and joy and beauty. The same principal applies to life in general—stop taking so many pictures, and feel your existence for all its worth! The time was coming to start thinking about what I was going to do for Carnaval, the great holiday at the beginning of spring when all of Brazil stops the routine to enjoy the party for 4 days. All the other Americans were eager to go to Rio de Janeiro, where they have a legendary Carnaval, very similar to Mardi Gras in New Orleans, with little clothing and much alcohol. I wasn’t too keen on this idea, mainly because I didn’t want to show up in Rio with twenty other Americans, running around like an obnoxious tourist in a mob of Americans, wind up speaking English with them the whole time, and on top, to have all the Brazilians that I meet living six hours away in Rio. My roommate, a Brazilian named Fazzi, had told me about another option… a few hours outside of town there was going to be a little music festival, with only two or three hundred people, where they’d play reggae, rock, and traditional Brazilian folk music… and everybody who was going there was from São Paulo. It wasn’t really “Carnaval” as people think of when they hear the word, with the schools of samba parading down the street, but I didn’t mind at all. Is there some sort of nonsensical rule that says “when one goes to Brazil in the spring, during Carnaval, one must watch the schools of samba as they parade down the street with their scantily clad beauties playing the drums and dancing to the rhythm”? Maybe there is such a rule, but I’d rather not be “one” anyway. So I decided to go out to the woods with two or three hundred Brazilians and hear what sort of noise they make. 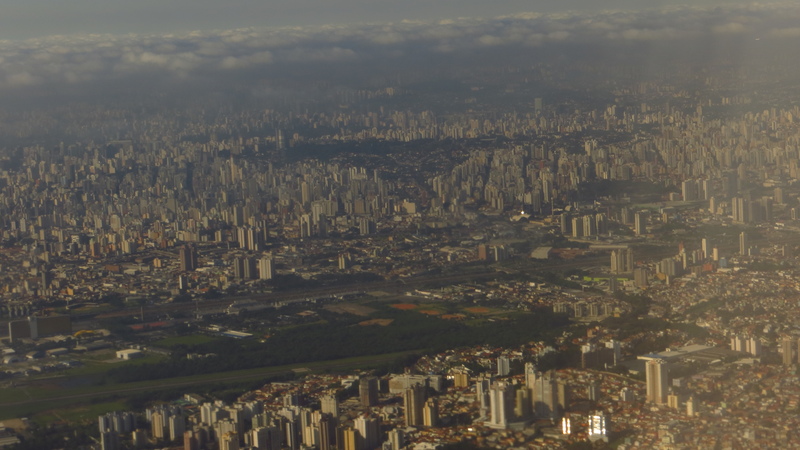 It took us two hours to get out of São Paulo, because of the traffic, and then another two to get to the festival… as the road left the city we climbed up into the heights of the deep green mountains, with rich forests in the spaces that hadn’t been cleared away for agriculture, and a wavy patchwork of crops covering the rest of the terrain… and the clouds crept low in the sky caressing the tops of the mountains, mixing with the steam rising from the earth to create a smooth silky curtain across the scene. It was beautiful! It reminded me of one morning driving across the U.S. when I’d been pushing through the Smokey Mountains of North Carolina, on my way to California, and the fog had reached up into the atmosphere in the same way, under different skies, before different people, but the event was really the same thing… so many people on this planet, all living their own lives. We got off the highway and onto the final road to the festival, descending out of the mountains and into the foothills… but these were pretty big foothills, and perhaps could even be considered mountains, with their steep slopes and dramatic streams flowing down their crevices. We saw an occasional horse-rider trotting along on the side of the road… many more farms now, the patchwork thickened… we passed by a tractor, slowly chugging along with a crew of 5 workers piled up on every spare space, some of them looking at us as we passed, others sitting with their heads hung under their sombreros, giving their eyes a rest from the sun that had cleared away the clouds over the past 30 minutes, leaving just the sticky steam from the wet earth and the heat from the gleaming sun. We finally arrived in Munhoz, the little town that the festival took its name from—Munhozstock—and it was a lovely little town with cobblestone streets, plenty of old volkswagons, a couple donkeys strapped to carts, every house painted a different brilliant color making a beautiful pallet of the street, and a small church as the focal point of the town, a locale that gathers the community into itself, allowing the unfolding of a common life. I saw an old man leaning against a wall watching a donkey and cart pass by… his head was tilted down, and his face was halfway hidden by his hat, which was a big “cowboy hat” as you think of with the old American West… I wondered what his life was like in this little town in the interior of Brazil—maybe it was similar to life in my hometown back in the hills and farms of upstate NY… but we rolled gently over the cobblestones and headed down the dirt road leading up the hill towards the music festival, nestled among the forest and the farmland, on the top of a hill, overlooking the great green expanse. On the top was a flat area for tents, with a trampoline that the children jumped on all weekend, but there was no room for our tent there and we headed down the hill to find a place to set up… as we walked down we could look across to the next hill where there were cows slowly making their way across the crest, and a farmer was relaxing on the front porch of his little red house, enjoying a cold beer on a hot summer day, looking over his crops, his cattle, and the maniacs on the hill next to him, setting up a little make-shift community for a few days of a different reality. We saw a couple terraced spaces for tents, but all of the flat areas were taken, so we found a nice grassy spot in between the two terraces, on a slight slope, and set up our tents there… I figured it’s just as well… if it rains the water won’t pool here, and it won’t be muddy like on the terraces, and it’ll be nice to be sleeping on my back on a slight slant, and when I wake up in the morning I can look straight out the door, across the little valley, and see the cattle grazing in the sun on the opposite hill. After we got our tents set up and we were situated, we started to mingle with the other people around us… I went for a walk down the hill and when I came back the others were all looking in disbelief at the guy who was staying in the tent right next to ours… he was showing them something in his hands, and Fazzi was all agitated, saying to this guy “não cara, não.” [no man, no] He was performing little magic tricks, switching a blue die for a red one when we were looking at the smooth movement of his other hand. Fazzi couldn’t believe his eyes, so he kept saying “não cara…” in an exhausted tone, as though this whole process was too stressful on his psyche…. This guy’s name was Filipe, and he was a real character—always with funny little remarks to push the conversation along in the direction of its previous momentum, not trying to take it over and lead it, but being led by the conversation itself… he had dreadlocks, like many people at any festival with reggae music, and he always carried around a little hip pack with a triangle clipped to it—you know, the percussion instrument. Whenever people started jamming, he was always ready with a subtle little rhythm on his triangle—I always got a kick out of it too—more or less, he always played the same rhythm, but I think it takes a certain type of musician to rock the triangle in such a way—the triangle is just so lacking in pretensions—it doesn’t seek attention, and doesn’t get much, but it does add much to the rhythm. We headed off to the bar to have a glass of wine before the nights performances. They had built a bunch of buildings in the area with the trees from the land. As you walked down towards the creek and its waterfall you passed a little area where all the trees had been cleared, and all the structures, and stairs down the steep muddy slopes, had been built with those trees, by the hands of the people who lived here. They’d built a bar, a kitchen and dining area, dormitories for a good number of people, and all the buildings with a nice spacious porch where you could look out into nature… into the unfolding of life… at the people milling around… playing music in little corners, in the little spaces between the tents, under the roof with the woodstove beneath… laughing and talking and sharing meals together… and the hum of the insects and the song of the birds mixed with the laughter of the humans, the sound of their music, and the occasional rumbling of a car passing by on the red dirt road, the earth rich with iron like the wilderness of northern Arizona. I remember sitting outside my apartment in the Phoenix night, enjoying the cool air and listening to the steady murmur of the traffic on the highway nearby. It always reminded me of the steady murmur of frogs or crickets on a humid night in the mountains of New York—the voice of each individual frog, of each individual cricket, is swallowed up by the general chorus of which it is a part. It reminds me of the din you hear at a party—or any large gathering of people—with all the voices contributing to a common mood and expressing it in a slightly different way. It’s the sound of nature, of life, of creatures and humans. Sitting here on the eleventh floor of an apartment building in São Paulo, I’m listening to nature again, and scouring the horizon, taking it in with my eyes. As far as I can see in any direction are twenty-story apartment buildings spiking up out of the steep hills—and countless highways cutting between them, the traffic running like blood through the veins and arteries of São Paulo, always loaded with cars, always contributing to the general din, to the murmur of nature in this city of eleven million. It’s much more than anything I’ve ever seen. People live their whole lives here and necessarily see only a sliver of the place. Its sheer size is intimidating, but beautiful at the same time. I remember the flight in. It seemed that everybody but me spoke Portuguese on that plane, that lovely sing-song language, and it was then that I got my first taste of what it’s like to be a foreigner, to be deprived of my mother tongue, to be immersed in a place utterly remote to my previous history. But it was just a taste—the kid next to me spoke English and he told me all about São Paulo—he was the son of Japanese immigrants to Brazil. And I listened to his stories and to the musical chatter of the children around the plane while their parents were fast asleep on the overnight flight. I hadn’t packed until the night before, and of course I’d had to see my friends that night too, so I wound up with three hours of sleep heading into a 22 hour flight (with layovers). As always I couldn’t sleep on the plane, and by the time I arrived I was delirious. I found the other Americans easily—well, one of the girls from the organization that arranged the exchange program found me easily, I should say… she spotted me and corralled me over to the other Americans. She had a paper with all of our photos printed on it to help her find us… like a cop looking for fugitives in a crowded airport. We waited around in the airport for a few hours, all of us totally drained, having been awake for roughly 24 hours a piece. I was dazed, and making stupid jokes with the other Americans, making them laugh at my nonsense. I wandered off and got a chocolate milkshake, fumbling through the process of ordering it, sucking it down quickly and then heading back to the group after eavesdropping on some conversations that were about I know not what. We exchanged US dollars for Brazilian reais and caught a bus to the business district, where we’d stay for our orientation into the program. 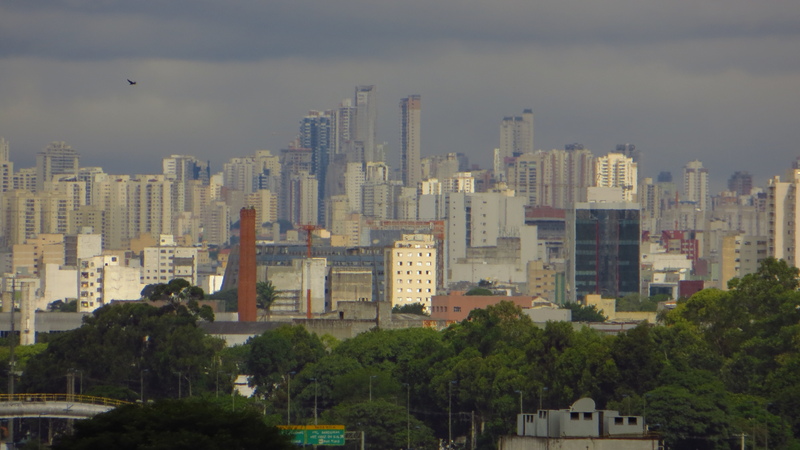 The bus-ride to Avenida Paulista was about forty minutes long, and it was nice to sit in the back of the bus—silently, away from the others—and to watch the scenery unfold outside my tinted window. Some new trees and plants, different logos on some of the automobiles, some differences in architecture, but more or less, from that seat, it looked like any other city I’d seen—people everywhere, bustling along through their lives, through their days, doing whatever it is that they need to do. I slept for a few minutes, and then we arrived. When I got a chance, I wandered around the streets nearby our hotel, groggily mumbling a few words of broken Portuguese to a vendor at a newsstand. On many of the newsstands around that part of the city they sell Aristotle, Dostoevsky, Sartre, Kerouac, Bukowski, Hunter S Thompson, Freud, etc—I was so pleased!… and I bought copies of a few of my favorites at cheap prices (around US $5-$10 each), resolving to read them to help me learn the language. And I wondered why don’t they sell these books at the newsstands or convenience stores back in the U.S.? Ech—maybe they do, but not Phoenix, and certainly not in the countryside of upstate NY, the land of my childhood. The two day orientation went by quickly, and none of us got much sleep. Each night we’d drag ourselves around the Paulista neighborhood, tasting the Brazilian drinks and the Portuguese language, tired out from the jetlag and the late hours. But soon enough I was in my home of the next six months—on the eleventh floor, like I mentioned already. I remember the first full day here. I was going to learn the routine—see how to get to school, where to buy food, where to have a drink, etc. My room-mate, Gino Fazzi—a Brazilian, whose grandparents had emigrated from Italy—showed me the bus I needed to take, and we got off the bus right nearby the campus, but we both had time to kill, so we went for a stroll to get some coffee. The coffee here is stronger than drip coffee in the U.S. but weaker than espresso – and it’s served in a little cup, 5 ounces or so. But Fazzi got an orange juice instead and was disgusted with its flavor. He has high standards though, for juice. You can get delicious, fresh squeezed juice at little cafés and shops all over the city—and at the open air markets you can find fresh squeezed sugar cane mixed with fresh squeezed lemons, or mangos or apples, or any sort of fruit you like— delicious!… take my word for it. In any case, Fazzi headed to work, and I headed to class. There’s not much to say about the first day of class—you know how it goes, it’s the same with any class— lingering in the classroom so as not to waste the time. Well, I shouldn’t say that though, the first day is important for getting to know the teacher and the other students. After class, I walked to the bus stop to head back to the apartment. Then I realize that I don’t have the slip of paper with the directions that Fazzi gave me—No! But, I remember the bus I took to get here—its name, and its number—so I just figure I’ll take that. I meet a kid at the bus-stop reading Dostoevsky’s Notes from the Underground, and I talk with him about Dostoevsky for ten minutes before his bus comes, and off he goes. I never encounter people reading Dostoevsky in the U.S., and certainly not Notes… at least not at bus stops. A pleasant surprise indeed! Anyway, I sit there for 40 minutes, and I never see the bus—not once! I did see a bus with the same number and a different name pass by, but that’s all. And here comes that bus again with the same number but a different name. I hop on—close enough, eh? I ask the driver a question about where the bus is headed, but he doesn’t understand a word I say, and he shoots back a question at me and I don’t understand a word he says. I just sort of shrug my shoulders to convey my indifference, pretend as though I know what’s going on, and head towards the back—there’s no seats because I’ve waited around for forty minutes and now it’s rush hour, so I stand there slopping around the bus because it’s lurching so much—it’s all over the road, and this driver really doesn’t care! He’s screaming around corners and tailgating motorcycles, slamming on the brakes so as not to kill them when they don’t speed up. So many hills in São Paulo too—they must have built the city on a mountain range!—that didn’t help the smoothness of the ride either. Most of the bus drivers are pretty tame, but this driver was a madman, I don’t know why he was in such a rush. The bus ride seemed to be taking much longer than the ride to campus in the morning—this was due to rush-hour traffic, as I know now, but didn’t know then, but should’ve known then—so I got off at a bus stop with a nice big platform, and tried to figure out what’s next. “What to do?” I’m thinking to myself. “I don’t know… I don’t have a clue!” I see a Walmart nearby—“ech! They even have these wretched places here,” but I head in that direction anyway—at least it’s something familiar. About 50 yards from the platform, the sky opens up and the rain just falls in torrents… it’d been drizzling for a good hour, but now it was ridiculous. I didn’t even run to the platform, I just continued in my long-legged gangly stride. Nearly soaked by the time I got there, I sopped down into a seat… everybody else was standing because the seats were soaked, but I didn’t care. No problems here!… so I’m soaked to the bone, and a bit chilly on top!… so I don’t know where I am in a completely foreign city!… so I have no telephone to speak of!… so I don’t know the address to my home here in Brasil! No big deal! The rain is still coming down like mad—at least I have certainty with that. I’ll just wait it out here, and when the rain lets up, then we’ll see—this is what I’m thinking to myself. The rain is coming in sideways now, and the little old frail woman standing next to me puts her umbrella sideways and tells me and another woman to get behind it… beautiful! I couldn’t understand her words, but the hand gestures made it clear what was what. The little old doll gives up some space behind her umbrella to us, what a sweetheart! But soon the rain lets up, thankfully, and I ask the woman how to get to Barra Funda station—I had remembered Fazzi saying something about Barra Funda being a possible way to get home, so I figure it’s worth a shot… I don’t know where I live, so I can’t ask them how to get there! She points me in the direction, but I’m not exactly clear on which bus stop I’m supposed to wait at. The rain starts up again… she gets on her bus… and I’m still sitting there, shivering by now, looking in the direction that she pointed me towards. Finally I just go. I plow through the rain—it’s not as bad as it was thirty minutes ago when it started anyway. At the bus stop, I see the Barra Funda bus come down the road, but it only stops on the other side of the road. I chose the wrong spot. I’ve got to find a phone and call Fazzi! Finally my bus came… I tried to leap over the stream to get to it, but it was pretty wide, and my left foot landed right in 4 inches of water, filling my shoe with the stuff… meh, a little more water, that’s all… I hopped on the bus, my left shoe making all sorts of squishy noises from the water, and by this time the bus was pretty empty—it was well after rush hour. I dropped into a seat like a corpse, exhausted from the day’s trivial ordeal, and checked my pocket for the keys to the apartment. And what do I find, but the directions that Fazzi wrote for me earlier that day, with the name and number of the bus I was currently on… I had a good chuckle then. As usual, I have trouble keeping my head straight about the simplest things. No big deal! It was fun to wander around in a strange place talking to people who I couldn’t understand, and slowly making my way back home through the wet. I slept well that night—worn out from the sleep-deprived flight, the reckless nights during orientation, and the rainy rainy day.